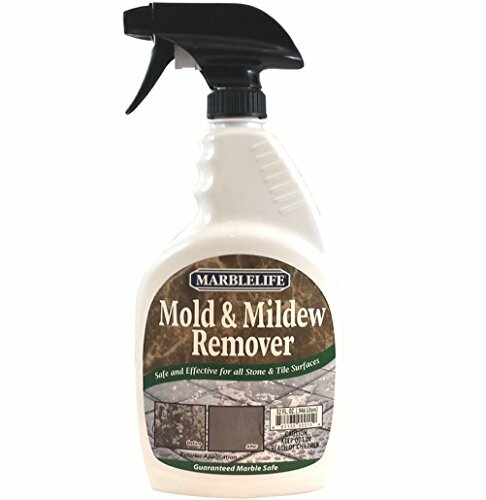 Marblelife Mold & Mildew Remover Specially formulated to eliminate mold, mildew, algae and fungus stains. 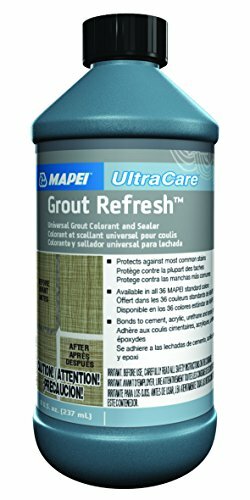 Removes odors from grout and tile. Recommended for use in bathrooms, kitchens, cellars and other damp areas where mold and mildew may form. Specially formulated to eliminate mold, mildew, algae and fungus stains. Protect your granite and keep it looking new! Black Diamond Stoneworks Granite Sealer is the finest quality oil and water repellent available. If you are looking for an impregnator sealer for your countertops that is easy to use with Professional results then you have found it! Using this granite protector will keep all your Granite Counters, natural stone, concrete, slate, brick, block, sandstone and grout looking new for years to come. Granite Sealer gives you the confidence your stone is protected. This is the best sealer for your granite plus it is easy to use and because it is water-based and low odor you can seal your natural stone and granite without smelling up the whole house and neighborhood. Just spray it on and dry it up. It is that easy. It bonds to the stone and repels water and oil-based contaminants preventing them from absorbing in, yet it allows the stone to breathe. Granite Sealer is a part of Black Diamond's STONEWORKS' line. This is our premium line of natural stone cleaners & sealers. They are designed to help you easily maintain and protect all of the beautiful stone and tile surfaces in your home or business. STONEWORKS cleaners and sealers are designed to offer you the perfect combination of unequaled product performance and value! Made in the USA. Designed, Tested and Used by Stone and Tile care Professionals! LOW ODOR SEALER FOR GRANITE, stone, concrete, grout and concrete. Apply Sealer let it penetrate and just wipe off excess - so easy to do! MARBLELIFE Marble & Travertine Cleaner. Designed for daily cleaning of marble, travertine, and other natural stones. Also safe for use on ceramic and porcelain. MARBLELIFE Marble & Travertine Cleaner goes where others can't, penetrating deep into the minute pores of your stone's surface to flush out oils and debris that can mar appearance. This marble cleaner delivers non-acidic detergent and surfactants to dissolve the oils and debris trapped inside pores, emulsifying them and lifting them up and off the surface, allowing them to be wiped away streak-free. Eliminating the oils and debris from your stones pores allows your surface to shine with all of its natural beauty. This marble cleaner works well on all types of natural and man-made stone surfaces as well as tile, grout, glass, chrome and finished wood. 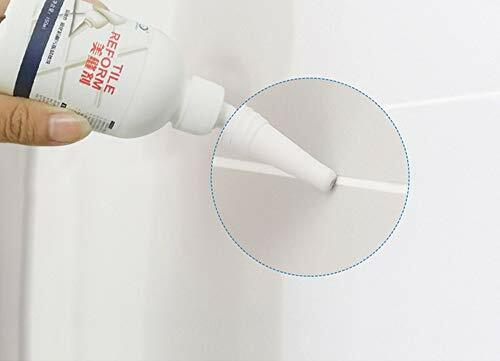 This is a marble countertop cleaner, marble vanity cleaner, marble floor cleaner, marble shower cleaner and marble tabletop cleaner. Formulated for marble and travertine surfaces this cleaner is safe and effective for use on slate, tile, ceramic and granite surfaces as well includign coutners, vanities, floors, and shower walls. 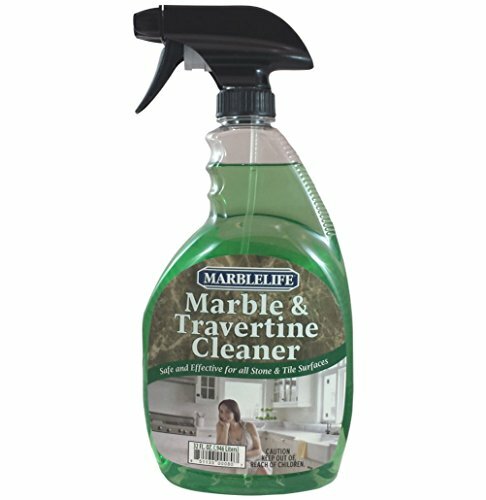 MARBLELIFE's Marble & Travertine Cleaner comes Ready-To-Use in this Easy-To-Use spray bottle, and for added convenience and economical value, MARBLELIFE's Marble & Travertine Cleaner is also available in a Ready-To-Use REFILL designed to save you packaging costs. Deep Cleaner - Safely renew grouts as it can be applied and bonds to cement, epoxy, urethane and acrylic grouts. 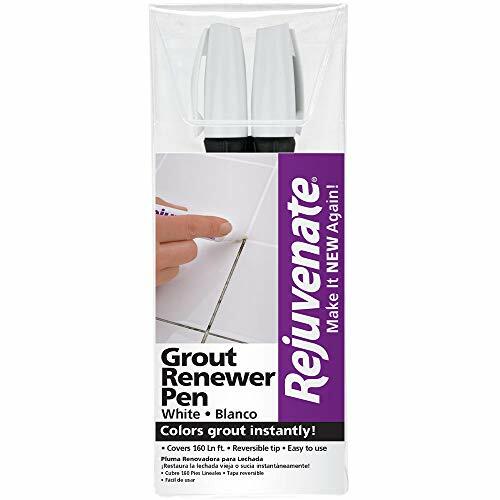 Easily to Apply, Easy to Clean - rejuvinate grout without using any machineries and cleans easily with no mess left behind. Risk Free Transaction - with Amazon A-Z Guarantee a full refund will be given if wont like our products. 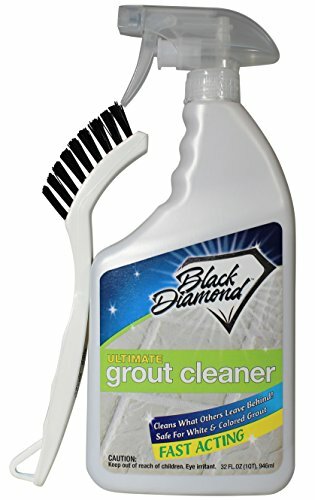 ULTIMATE GROUT CLEANER: Best Grout Cleaner For Tile and Grout Cleaning, Acid-Free Safe Deep Cleaner & Stain Remover for Even the Dirtiest Grout, Best Way to Clean Grout in Ceramic, Porcelain, Marble. NOT FOR MOLD OR MILDEW but kicks but on grease dirt grim and stains. 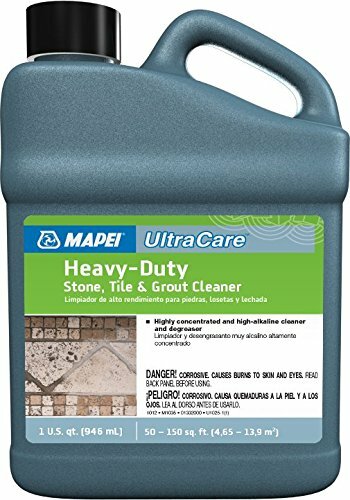 UltraCare Heavy-Duty Stone, Tile & Grout Cleaner is a highly concentrated and high-alkaline cleaner and degreaser. This product is formulated to quickly remove most waxes, grease, oil, light soap scum, and stains from mildew and algae. It is quite effective at removing most factory-applied waxes and floor finishes, and is ideal for areas that have been neglected or subject to heavy use. Alink is coming! Stop using a toothbrush for cleaning grout! 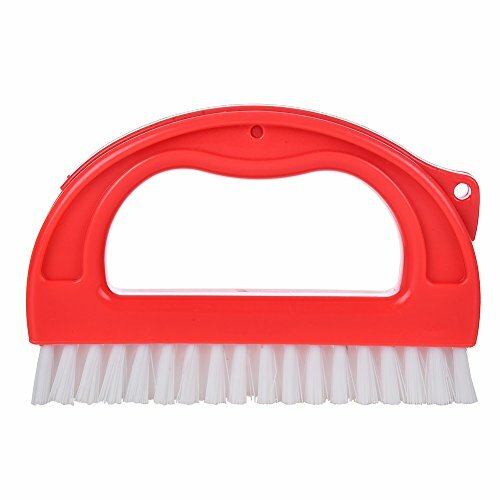 Here you can find a brush who cleans the narrow of the tiles very well and makes cleaning the tiles in the bathroom so quick and so easy. Why Choose Alink Grout Brush? Good grips - Can use this without causing pain in your hands, also using less pressure. 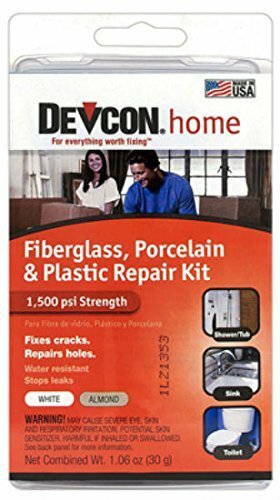 Check the grout for cracks or loose patches. Some cleaners and sealants can be potent enough to require special precautions. This job doesn't require special skills, but it does require patience. Create plenty of ventilation to carry away cleaner and sealer odors. Item Shipped From United States, Not China. You will receive it within 7 working days, so do not worry about the transportation problem. If you have any question, don't hesitate to contact us. We will provide the best service for you. Size: 4 Inch Brush have a quarter inch quick change shaft. 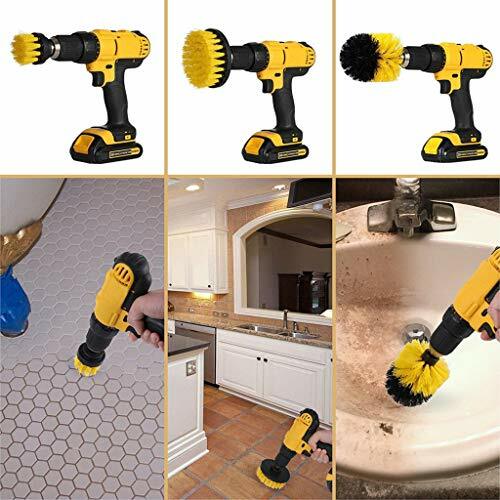 This drill brush attachment kit includes 4 brushes with different sizes and shapes to fit into most of the cordless drills, such as Dewalt, Bosch and Makita etc. All Ouniman Products have a 90 day no questions asked Money back Guarantee. If you are not completely satisfied with our product we will issue a full refund or ship out a replacement at the buyer's request. Cordless Drill NOT included. Presenting professional-strength grout cleaner that works harder & goes farther. Kit includes two 1-quart bottles + stand-up brush + exclusive handheld brush. Tired of getting down on your hands & knees to scour & scrub grimy grout? It's stronger: Brilla penetrates deeper to pull even the stubbornest grime up to the grout surface, where it can be whisked away. It's thicker: Unlike thin, watery grout cleaners which tend to splash & splatter Brilla stays inside the grout lines. Result: less waste, more concentrated cleansing power. Three 1-quart bottle clean up to 1,275 square feet. Add to cart now for sparkling tile that looks as clean as new. POWERFUL COMMERCIAL-GRADE FORMULA: Even the toughest stains & haze can't stand up to Brilla Grout Cleaner. This advanced cleanser literally lifts out grime to clean & whiten even the dirtiest grout. LESS WASTEFUL: Watery grout cleaners splash all over, so you waste more than you use. But Brilla has a thicker consistency, so you can apply it directly to the grout line without wasting a single drop. NO MORE GRUELING SCRUBBING: Brilla Grout Cleaner raises the dirt and grime out of your tiles, allowing easier and simpler cleaning! DON'T GET CAUGHT WITH A DIRTY BATHROOM: Keep your home clean and guest-ready with Brilla Home - a sure-fire way to impress family and guests alike! GREAT VALUE, 100% GUARANTEED: Priced more affordably than most, your Brilla grout stain remover comes with our special promise: If you're not 100% satisfied, we'll gladly refund your purchase price. 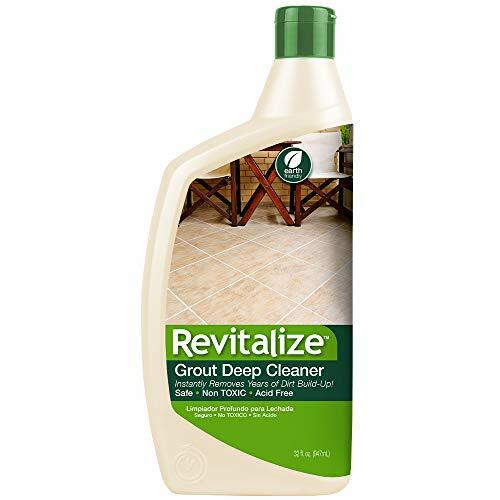 Revitalize Grout Deep Cleaner is the best way to clean grout and instantly remove grout stains and restore your grout back to its original color. Over time, everyday foot traffic or general use along with accumulation of grease, dirt, spills, food, pet stains and more make your grout dirty and dingy. This revolutionary, non-toxic, acid free formula is the best way to clean tile grout. 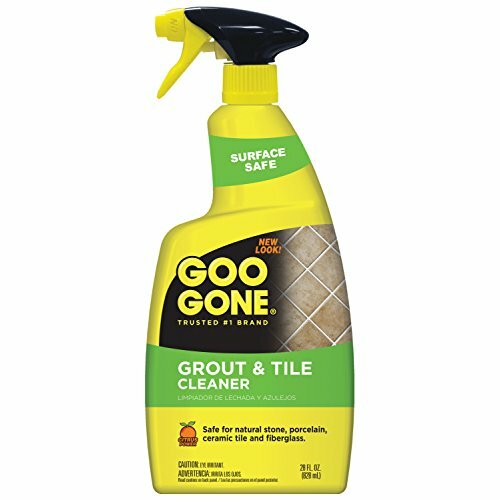 Pair this new formula with a grout cleaning brush and a professional grout cleaning system is in your hands. Use on any tile surface - including ceramic tile, porcelain tile or marble as the easiest way to clean grout without scrubbing for hours. The grout deep cleaner is strong enough for commercial use but gentle enough to use at home. Reward yourself and make an impact on visitors with the deep clean easy application from Revitalize. For best results, apply with our to your grout and allow 2-3 minutes to absorb. At this time, the bio-enzymatic action is working to eliminate all the deeply embedded dirt and grime from your grout lines. Now use our thin nylon grout brush and lightly agitate the grout lines. Then simply wipe off with a microfiber mop when you're done or rinse the area with water. Step back and watch as your grout is transformed back to its original color. From Revitalize - Best in Class Products Made in the USA. 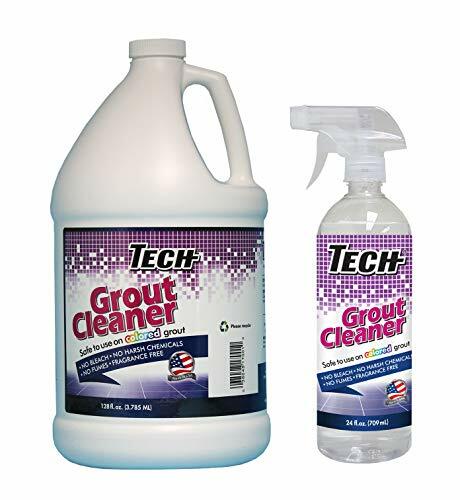 TECH Grout Cleaner is the safe and easy way to clean dirty grout. This non-acidic formula is odorless and 100% biodegradable so it is safe to use around your family and pets. Spray it on, use any old grout brush, and rinse or mop to restore your grout to like new. That's all there is to it! Great for the daily maintenance and general cleaning of grout. Works on all grout including colored grout. 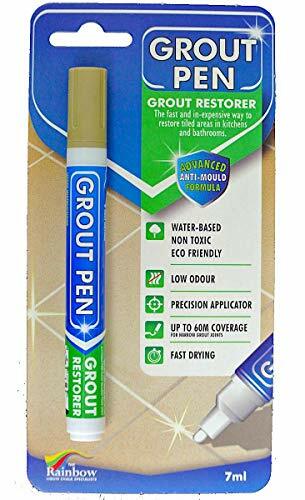 Directions: Spray TECH Grout Cleaner on grout to be cleaned, allow to penetrate for 15-20 seconds, agitate with any hard bristle brush and rinse or mop with fresh water. Allow grout to dry. Includes one 128-oz bottle and one 24-oz bottle with spray nozzle. 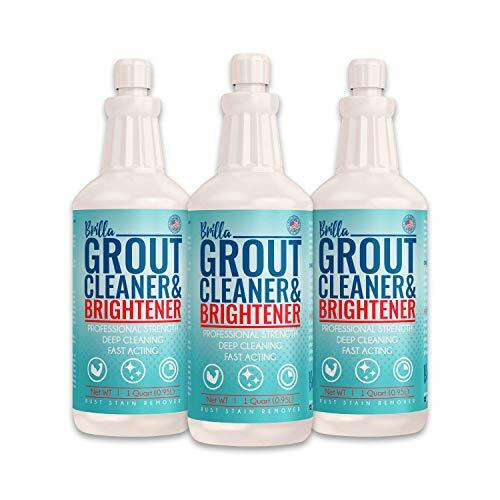 TECH Grout Cleaner is the safe and easy way to clean dirty grout. This non-acidic formula is odorless and 100% biodegradable so it is safe to use around your family and pets. Spray it on, use any old grout brush, and rinse or mop to restore your grout to like new. That's all there is to it! Great for the daily maintenance and general cleaning of grout. Works on all grout including colored grout. 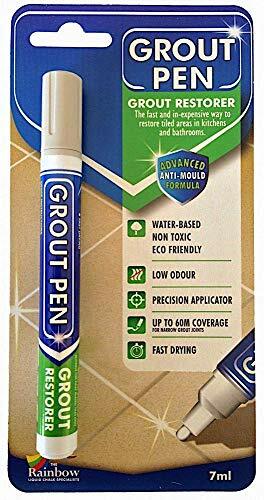 Directions: Spray TECH Grout Cleaner on grout to be cleaned, allow to penetrate for 15-20 seconds, agitate with any hard bristle brush and rinse or mop with fresh water. Allow grout to dry. Includes one 24-fl-ounce bottle with spray nozzle attachment. Easy to use. No need to wear gloves or a mask. Leaves No Residue. Will not discolor colored grout. Non-acidic formula is 100% biodegradable. 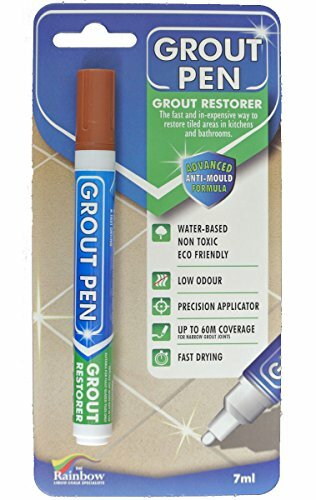 Cleans and restores your grout to like new. 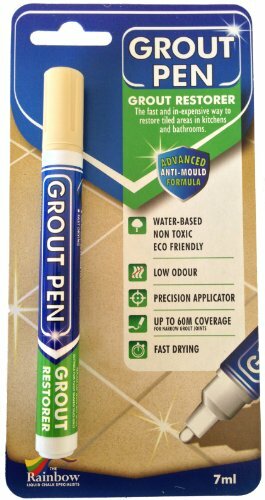 Features: A ready use grouting fill in product, most easy grout product ever on the market! White color grout to fix and cover all those old and dirty grouting. Provides anti-fungus feature to prevent fungus grow on flooring. Amazing bright white tile gap filling agent that is Waterproof and Moldproof! Use it for bathtub tiles, washbasin, bathroom toilet tiles, balcony sink, porch tiles, corridor tiles and other cracks landscape. 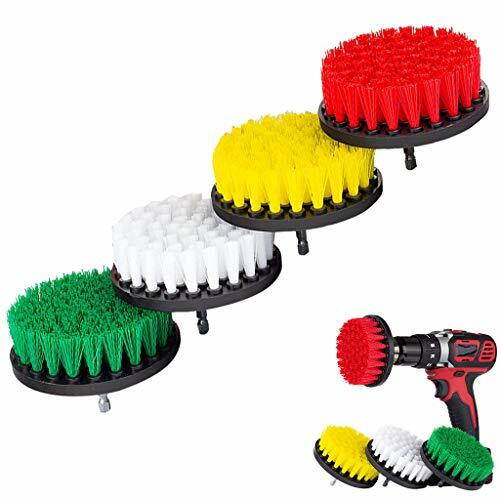 3 shape of brushes clean your bathtub, grout, upholstery, bathroom surface, floor, tile, shower, toilet and carpet etc, Nylon bristles will not scratch surfaces of them. 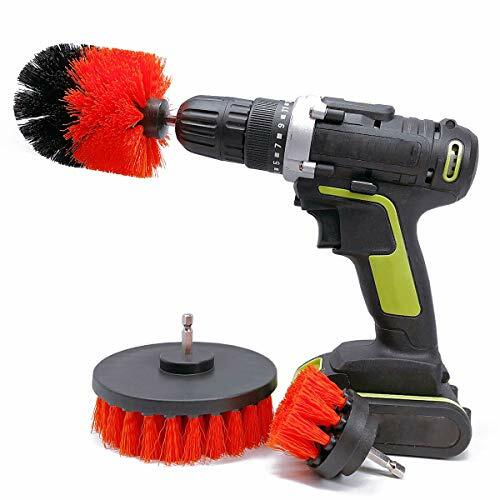 This cleaning brush kit includes 2", 3.5" ,5" orange medium stiff drill brushes.5" flat brush cleaning tub,floor,carpet more effective compare to 4" brush. Competiable for most cordless drill.Designed for clean bathtub, grout,bathroom surface, floor, tile, shower, toilet and carpet etc. Nylon bristles will not scratch your bathtub and shower tile surfaces. Cleaning and Removing hard water stain easy and effective because brush attach to power rotary drill. Recommand to lightweigt cordless drill and use with low speed. Recommand to lightweigt cordless drill and use with low speed.